Guess what dog owners! There’s a special day for your favorite 4-legged friends! International Dog Biscuit Appreciation Day falls on February 23rd of every year, although I have no idea why. In fact, I can’t find much on the actual history of this fun holiday; but does it really matter? Any excuse to shower your dog with love and biscuits is a good one, right? While there isn’t much in the way of historical information surrounding International Dog Biscuit Appreciation Day, there is plenty of info out there about dog biscuits themselves. By the 19th century, hunters began giving their sport dogs hard barely meal biscuits for energy during a hunt. Slowly the grain-only biscuits evolved into treats made from grains and vegetables; by the end of the century meat was added. There is conflicting information about when and where the modern-day dog biscuit was first manufactured, but it seems that people agree it all happened in the mid-1800s. According to PetCentric.com, in the 1850s an electrician in Cincinnati named James Spratt had a brilliant idea after watching a group of dogs gnawing on the cheap rock-hard biscuits that sailors ate while out to sea. In 1860 James Spratt created Spratt’s Patented Meat Fibrine Dog Cakes which were made with meat and sold as dog food. The dog biscuit page on eNotes.com, however, tells a different story. 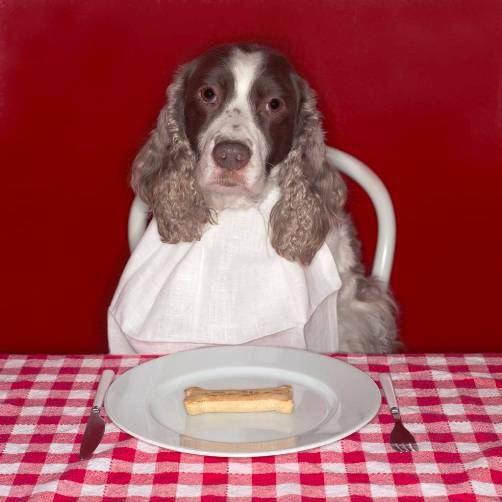 According to them, dog biscuits were invented by accident during the late 1800s by a butcher in London. In this version, the shop’s owner was trying to garner more business by creating a new biscuit recipe for his customers. After baking and tasting the first batch, which apparently tasted horrible, the man threw one to his dog; who immediately ate the whole biscuit. Knowing a great idea when he saw one, the butcher used the recipe to make biscuits especially for dogs. He shaped them to look like bones and soon the new dog treat was flying off the shelves. In 1908, the dog biscuit recipe was bought by an American businessman who took it back to the United States and founded the F.H. Bennett Biscuit Company. Selling the dog biscuits under the name “Malatoid” the recipe was granted a patent in 1911. In 1915 the name was changed to “Milkbone” to pay homage to one of the main ingredients, cow’s milk. By the late 1960s, Milkbone was purchased by Nabisco Biscuit Company and dominated the dog treat market. Of course, the fact that they were the only dog biscuit company may have had something to do with it. It wasn’t until the early 1970s that other manufacturers developed their own dog treat products. 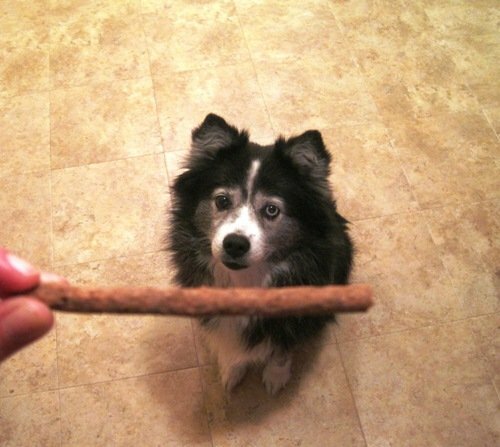 Happy International Dog Biscuit Appreciation Day! How do you plan on celebrating? Here’s a picture of Kasha, the Mullins Farms dog celebrating the day by waiting patiently for her treat…..
Kasha, the coolest farm dog! This entry was posted on Wednesday, February 22nd, 2012 at 9:30 PM	and is filed under Misc.. Both comments and pings are currently closed.